958 illuminated drones were used to create the red logo and border. The display was 100 metres tall. 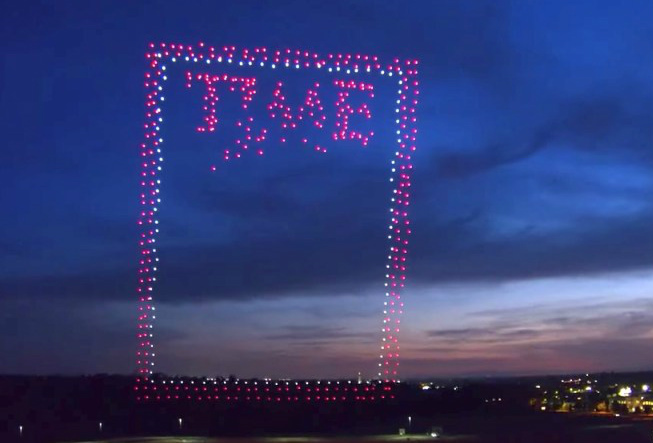 TIME partnered with Intel’s Drone Light Show team to create the cover. The drones were launched in Folsom, California (Intel has a campus here). The cover photo is a still frame taken from footage filmed by a drone. Using a drone is a first in TIME’s 95-year history. Watch how TIME’s drone cover was created with 958 of Intel’s Shooting Star drones. The Drone Age discusses how drone technology is expanding into almost every industry. From combating terrorists to delivering medical supplies, drones are transforming our world. It’s definitely an exciting time to be in the drone industry! Our CASA-approved remote pilot training packages are designed to get you started in the drone industry. We offer drone training courses around Australia . View our course dates or contact us with any queries or for more information.